Every aquatic animal is adapted to its own particular lifestyle and habitat. Take the slow-swimming graceful manatee, for example. The manatee may look like a cousin to the walrus, but its closest living relative is actually the elephant. And like the elephant, it has a large prehensile upper lip that it uses to pull food into its mouth. Each side of the lip can move independently of the other. Behind the lips, horn-liked ridged pads break food down to smaller pieces. Manatees are one of the only animals that keep replacing their teeth their entire lives. They have four sets of six to eight marching molars. As the front molars wear down, they fall out. The molars behind them move into place, or, march. Manatees don't have necks. They're the only aquatic mammals to have only six cervical vertebrae instead of seven. So if it wants to turn its head, the manatee has to move its entire body around. The pectoral flippers are jointed and flexible, with three to four nails at the ends. They're used for steering, crawling, and for putting food into the mouth. Manatees eat anywhere from 10-15 percent of their body weight in food each day. Their digestive tracts take up a large portion of their internal body cavities. The intestines can be up to 150 feet long. The powerful tail fluke propels the manatee through the water. They can swim upside down, vertically, and can do somersaults and barrel rolls. Each lung is in its own separate cavity. Instead of one diaphragm like many other mammals, manatees have two hemi-diaphragms. With each breath, manatees change 90 percent of the air in their lungs. Humans change 10 percent when they breathe. Manatee lungs also help with buoyancy control. The small eyes don't have eyelashes, but they do have a nictitating membrane for protection. Think of it like an extra eyelid. Manatees can see fairly well underwater. Their retinas contain both rod and cone cells, indicating that they can see both dim and bright light. Their nostrils close automatically when going underwater. They don't have external earlobes, but anatomically, manatees appear to have good hearing. They have very large ear bones. You can tell how old a manatee is by counting the annual growth rings in the ear bone. 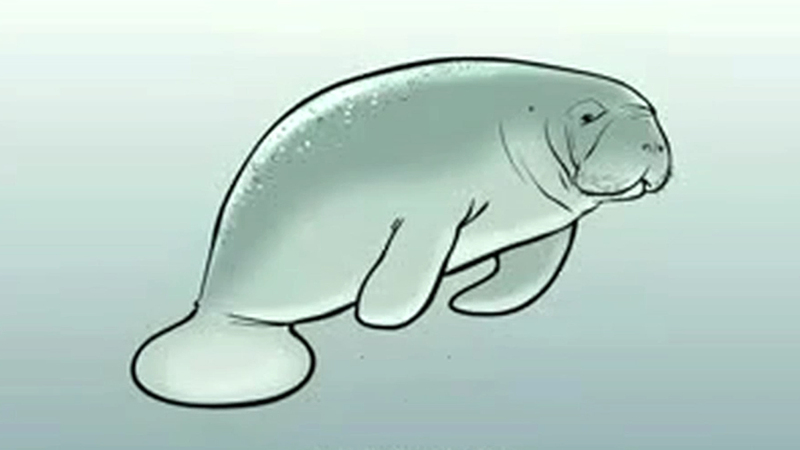 The manatee does have some hair on its body, the most being around the snout. These vibrissae are connected to a substantial nerve network and transmit tactile information to the brain. All these parts working together make the manatee one well-adapted, marvelous mammal.